"If we don't change our direction, we are likely to wind up where we are headed." 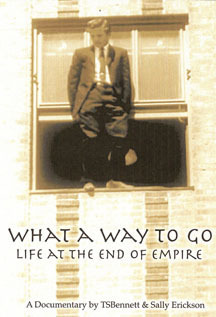 Mud City Press was fortunate enough to get an early view of the documentary WHAT A WAY TO GO (Life at the End of Empire) by Sally Erickson and T.S. Bennett. 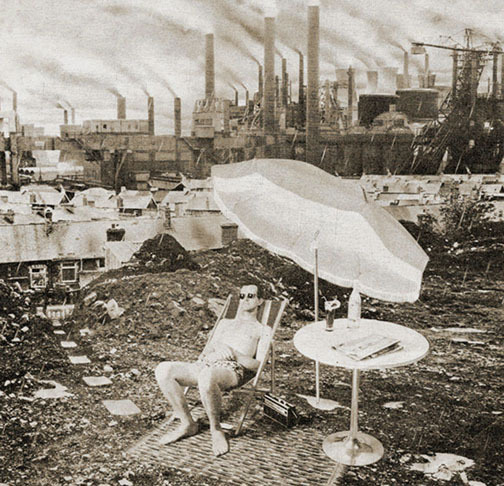 A personal commentary on the direction of modern society in the twenty-first century, WHAT A WAY TO GO is described on the back of its DVD package as "a middle-class white guy coming to grips with peak oil, climate change, mass extinction, population overshoot, and the demise of the American lifestyle." It might also be described as the non-Hollywood version of Al Gore's documentary on climate change. This is not meant to be dismissive. Not at all. It's an accolade. If what Gore offered was an "inconvenient truth," WHAT A WAY TO GO gives us the "whole truth." That is, Gore's story with peak oil, unsustainable agriculture, and our mass assault on the community of life added in to fill out the picture of climbing atmospheric carbon concentrations and melting ice caps. WHAT A WAY TO GO is a grim documentary about a situation many of us are already too familiar with. But it opens an aspect of the fossil fuel quandary that I quite frankly have neglected to acknowledge in others and perhaps in myself. To scientists and researchers, there is a certain dry geologic acceptance to peak oil and climate change. Like one day, five billion years from now, the sun will burn out. To parents, concerned young adults, and ordinary folks, however, there is a growing fear and a resultant personal grief connected to these looming economic and environmental unknowns. This, among other things, is what WHAT A WAY TO GO confronts with meaningful honesty. I had some idea what this documentary was about when I got the DVD in the mail, a rather edgy and personal account of a middle-aged man confronting the collapse of our way of life. The petroleum empire is going down. We've been too reckless with the planet's natural resources, particularly fossil fuels, and the biosphere is suffering badly. Global warming will wrap a thousand mile-wide band of desert around the equator of planet Earth. The migrating millions will go north and south looking for water. At the same time, the skyrocketing cost of petroleum products, and all they mean to the economy, will bring on an extended recession in the affluent societies of the West. We are likely to face some kind of extended catastrophe. Famine. Pestilence. War. A mass die-off. I believed too much of this scenario and mostly just wondered if my life would last long enough to see it play out. For me, taking any kind of serious appraisal of the condition of human civilization on the wet planet usually involved writing frantic rants or drinking. I put the DVD in the machine with a bit of trepidation. Being retold the doomsday scenario could go one of two ways with me. It could bounce off or deeply penetrate my entire psyche. I appraised the DVD cover. It showed a man perched high on a window sill preparing to take the big jump. I'm not particularly optimistic, and I didn't really need any extra reasons to bail. I punched play anyway. The documentary begins as a very personal story. An ordinary American male growing up in the Midwest, living the 1950s American dream. Another passenger on the speeding train of industrial society, enjoying the ride, taking in the view, until that day he realized, "Old Charlie stole the handle." The train won't stop going. There's no way to slow down! Little by little, as the narrator expanded this metaphor to climate change and the economics of peak oil, I gradually understood that T.S. Bennett was not just recounting the Club of Rome's scenario of unchecked industrial expansion and his own awakening to the meaning of it. He was revealing what he felt about the condition of our planet in a very visceral way. We all have an intellectual side that allows us to put the pieces of this story together. And we can hold this out, away from us as an abstract analysis. But there must also be a psychological response, perhaps held muted within, to the prospect of vast social upheaval brought about by egregious mismanagement of the planet. There must be deep emotions within all of us connected to this sad socio-biologic unfolding. We're watching, to some large extent the world, but more specifically the United States face a brutal fact of life. Cheap oil held this nation together economically. The wealth, the lifestyle, our dreams. Cheap oil is now a thing of the past. America as we once knew it is dying. And there is real reason to grieve. And yet it seems denial or evasion is the more common response. That's the problem. And perhaps why we have yet to really confront the problem head on. We aren't truly feeling the sadness and frustration that destroying ourselves and our planet home should impart. WHAT A WAY TO GO is one man saying what he really feels about the insanity of it all. One man letting out a deep primal scream. How could this have happened while we were watching so closely? How could this have happened at all? We just filled the skies with carbon exhaust until it suffocated us and all of life with it. AGGGRHHHH! America has changed. It's become a caricature of itself. The democracy has been compromised. We are a country gone to war to defend burning fossil fuels–and a way of life that has proven wasteful, foolish, and disastrous. And to face that, you must also accept that you are no longer who you thought you were, because the social premise that provided you with a belief system has proven to be false. Grief is called for. Grief is justified. We face a great turning in the ways of earthlings, and there is good reason to scream–or cry. This perspective alone makes WHAT A WAY TO GO an important documentary. But in the view of this audience of one, the material is put together so artfully, with such attention to detail and with such clear emotion that it becomes something more. Mixed in with the interviews of thoughtful commentators like Richard Heinberg, Daniel Quinn, Jerry Mander, Ran Prieur, Chellis Glendinning, and Derrick Jensen, is a wonderfully edited docu-collage and prose poem. There is enough footage from the 1950s, cuts from televisions shows, commercials, movies, and grainy home movies to remind us of our own lives, our own evolution from believing baby boomers to disillusioned young adults to lost pawns in the grand chess game. Add to this, T.S. Bennett's lyric writing, its depth, its tragic irony, his clear frustration, voiced over clips of film Americana and current events, and the viewer gets a very powerful psychological make over from the 123 minute film–with one very disheartening conclusion. The life we have just lived, the last fifty years, the height of the fossil fuel era, is headed to a dead end, a collapse. And so is the psychic infrastructure of the personalities created in that great gush of comparatively free energy. We now enter a tenuous time of social revolution. That will be impossible to dodge or ignore. And while the presiding powers are hanging on to every last penny of profit with denial and propaganda, the middle-class American sees it happening day by day. A definitive pinching in, gas prices, medical insurance, food costs, daily news of young men and women's lives lost to war. And all the while, no one is letting up. The highways are more tightly jammed than ever. We burn more and more petroleum with each passing day. This insane lemming-like race to the edge just continues. Blindly. A contradiction to life and reason. That merits human grief and anguish. And if you don't feel that, if you've missed that critical point, Bennett and Erickson's documentary brings it into focus for you and does this powerfully, with emotion, a measure of derision, a certain resignation, and a sad refrain, "what a way to go." Can we even imagine truly changing the way we treat the Earth? 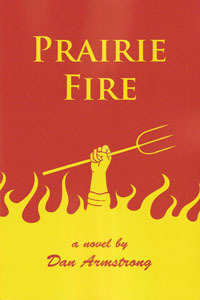 How about a little PRAIRIE FIRE! It's a few years from now, and the human and environmental costs of industrial farming have finally caught up with America's family farmers. Instead of throwing in the hoe, farmers across the Heartland rise up against the combine, threatening to burn their crops rather than burn the land with petrochemicals. Read full synopsis and/or sample chapters. AVAILABLE NOW at iUniverse. and Amazon.com.